Give the gift of an original painting on reclaimed wood. 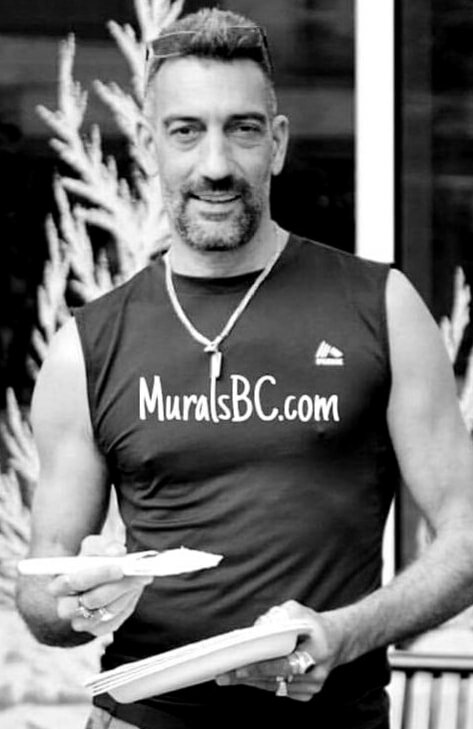 ​commercial and residential wall murals and window paintings in Victoria BC and beyond. Call / text Mario for your free consultation today. Affordable beautiful colorful spring themed window paintings which will embellish your place of business and certainly get you noticed. Residential and commercial window paintings. ​Children room murals, daycares, schools, residential, commercial, garages, fences, window splashes. Interior/exterior murals. If it can be imagined, Murals BC can paint it. Beautiful murals painted directly onto your fence. Fence murals are an affordable way to spice up your yard and enhance the garden. ​Mario's brushes and paints are ready to create a beautiful scene on your fence. Contact Mario for your free consultation! One of three new murals unveiled in Chemainus on August 20th, 2016. Grindstone Cafe wall mural in downtown Victoria BC. View more details and faq's about my Christmas window paintings in Victoria BC. Thank you for your interest in my wall, fence and window mural art. As a professional mural artist for over 20 years, I strive to bring your vision and ideas to reality. I love my work and am especially very excited when I paint a wall or window mural and see the joy that my murals bring. Every day that I paint I feel blessed to be able to follow my passion and share this with everyone who views my work. At times I even feel like a big kid who get's to paint and scribble on walls all day long. I am looking forward to hearing from you and brainstorm some ideas for your wall or window mural, do not hesitate to contact me anytime. You may also find more of my mural designs at www.ArtistBC.com or on Facebook. Although I reside in Victoria, BC I do travel throughout the province to paint murals.